Install WDS on your Windows 2003 Server. On Windows Server 2003 SP2, go to Start > Control Panel > Add or Remove Programs > Add / Remove Windows Components > Windows Deployment Services. If you are using Server 2003 SP1, you have to install RIS first, then upgrade to WDS using the Windows AIK. 1. 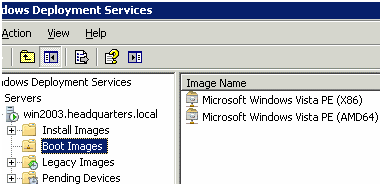 On the Start menu, click Administrative Tools, and then click Windows Deployment Services. 2. In the left pane of the Windows Deployment Services MMC snap-in, expand the server list. 3. Click the server that you want to manage. 4. If the server is not in the servers list, right-click the Servers node to add a server. 5. In the Add Server(s) dialog box, click Another computer, and then browse to select the computer to manage. 6. In the Add Server Warning dialog box, click Yes to add the server. 7. Right-click the server that you want to manage, and click Configure Server to start the Windows Deployment Services Configuration Wizard. 8. At the Welcome page, click Next. 9. At the Remote Installation Folder Location page, click Next to accept the default location (C:\RemoteInstall). 10. If the Microsoft DHCP service is on the server that is being configured as a Windows Deployment Services server, set DHCP Option 60 to PXEClient and set Windows Deployment Services to Do not listen on Port 67. 11. On the PXE Server Initial Settings page, click Respond to all (known and unknown) client computers. 12. Click Finish to complete the configuration. 13. Clear the Add images to Windows Deployment Services now check box, then click Finish. 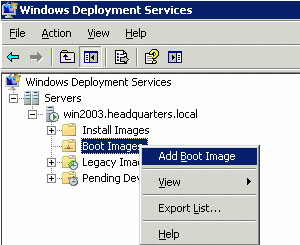 In the WDS control panel, right click the “Boot Images” folder and select “Add Boot Image”. Browse to the folder that has the *.wim files. This file will be located into your MDT folder. Add both images (x86 & x64), then restart WDS and 2 new boot images will appear in the “Boot Images” folder. We will use the “Windows Vista PE (X86)” image for this example. Once this is completed, you should be able to PXE boot your machine and your MDT deployment should start. Remember, to PXE boot your machine you should configure the BIOs to boot PXE.